In this article, ScreenAnarchy delve further into Adrian Gaston Fares upcoming horror movies, Gualicho / Walichu, Blood Window First Feature Film Production Award Winner, and Mr. Time introduced to local and international co producers, film festivals, distributors and sales agents, in the last Marché Du Film Market at Ventana Sur. 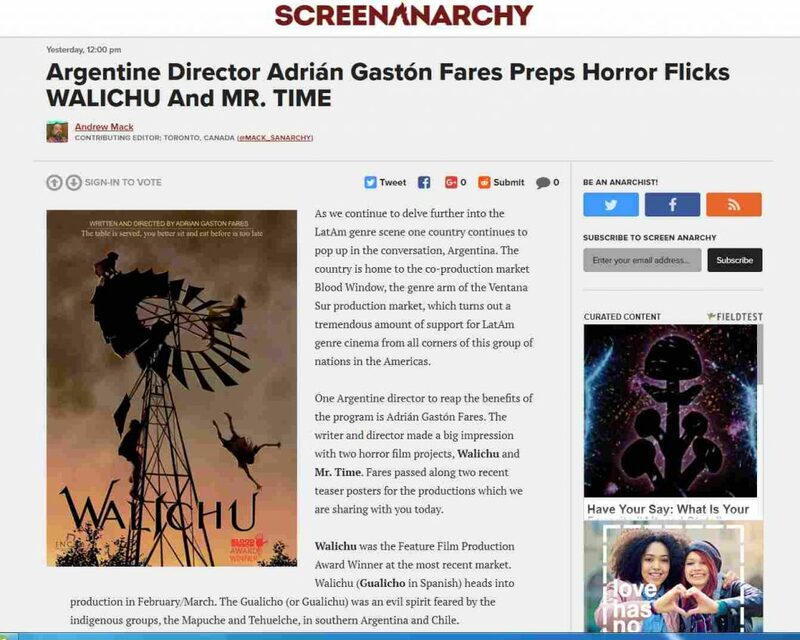 Andrew says Argentina genre cinema continues to pop up in international cinema conversations and that Walichu (Gualicho) and Mr. Time are examples of that new argentine fantasy-horror wave. He talks also about the co-production market Blood Window and Marché Du Film Ventana Sur as very good supporters of this Argentina´s new fantastic and horror films. Entrevista a Adrián Gastón Fares por Alvarez Galloso. Una tarde con A. G. F.
Entrevista a Adrián Gastón Fares en Revista Pazcana por el premio a Gualicho y su trabajo literario. Copyright © 2019, Corso Films. info@corsofilms.com.